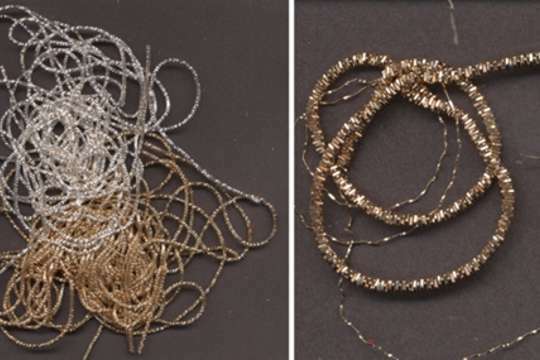 Old-fashioned crinkle wire, just like the tinsel used on antique European holiday ornaments. Use it as is or stretch it out and use it in its crinkly form. Wrap it around your project, bunch it up it up, just play with it. You might even want to use it as a curly tinsel garland for a feather tree! SilverCrow offers our Golden Krausbouillion in packages of about 2/3 ounce (give or take a little bit). . 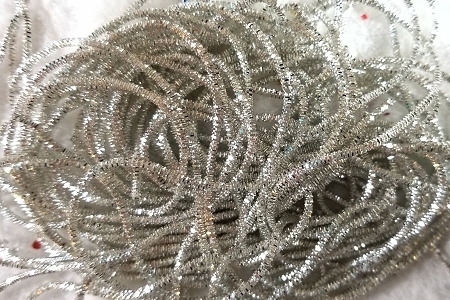 Although silver Krausbouillion is the traditional color used in most older European ornaments, some ornaments were made with gold crinkle wire as well. The original Krausbouillion is made in Germany and Austria. 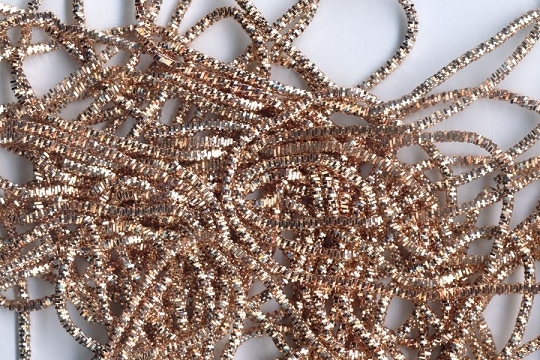 Ours is made by a modernized process that plates copper wire, so it is less expensive. It's quite beautiful and lends old world elegance to any project. The silver krausbouillion in the second photo is for demonstration only. It is not included in your package of golden crinkle wire.